3.8 out of 5 based on 28 bloggers and 8 commenters. 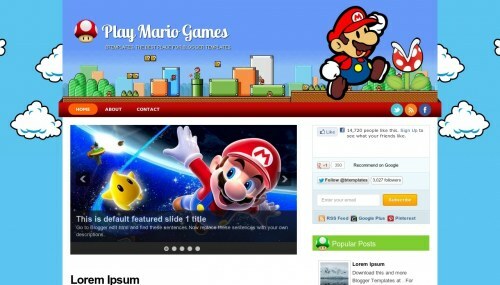 Play Mario Games is a free blogger template with 2 columns, right sidebar, footer columns, slider, social bookmarking icons, posts thumbnails, well designed threaded comments and vectorial elements. cara buat blog kaya gini gmn? como eu mudo o fundo? how i changge the background? I see a error on IE?